If I might humbly venture to suggest an opinion on the subject, I should recommend the use only of such Indian forms, or proportions, as bear the least resemblance to those either of the Grecian or Gothic style, with which they are liable to be compared. 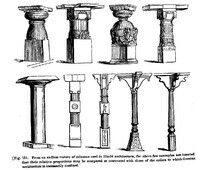 If the pillars resemble Grecian columns [compare fig. 135 with fig. 136], or if the apertures resemble Gothic arches, they will offend, by seeming to be incorrect specimens of well-known forms, and create a mixed style, as disgusting to the classic observer as the mixture in Queen Elizabeth's Gothic. But if, from the best models of Indian structures, such parts only be selected as cannot be compared with any known style of English buildings, even those whom novelty cannot delight, will have little cause to regret the introduction of new beauties.